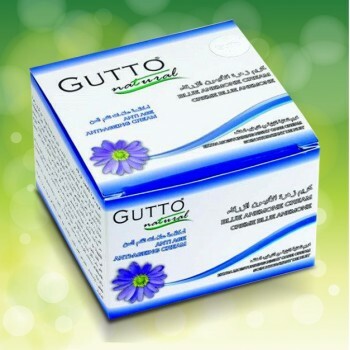 Get powerful anti-aging protection the natural way with Gutto Natural blue anemone night cream. This efficient moisturiser delivers results similar to botox through a special formula of plant extracts. This efficient moisturiser delivers results similar to botox through a special formula of plant extracts. The active ingredient in this night cream is kinetin – a natural growth hormone obtained from the blue anemone flower, which aids cell renewal for a youthful appearance. Ideal for use at night, this kinetin-rich facial moisturizer penetrates deep into the skin layers to active cell renewal. Because this naturally scented kinetin night cream contains no chemicals or artificial fragrances, it is also kind to the skin. For best results, apply each evening after cleansing in upward strokes and use alongside Gutto Natural Pearl anti-aging daily moisturiser. Use for at least one month to see noticeable results.